So Kartik is coming up. I wanted to write about that but alas, I have no pictures from my Kartik in Mayapur last year. It’s not that I didnt take pictures. Its that I took pictures, felt that they were too dark, erased the pictures and decided to try again later which never happened. So I’m pictureless. But we can use our imaginations. All the lights are off in the temple, and the altar is dimly lit by candles. Ooohhh! I found a video from last year! God, I miss those days. 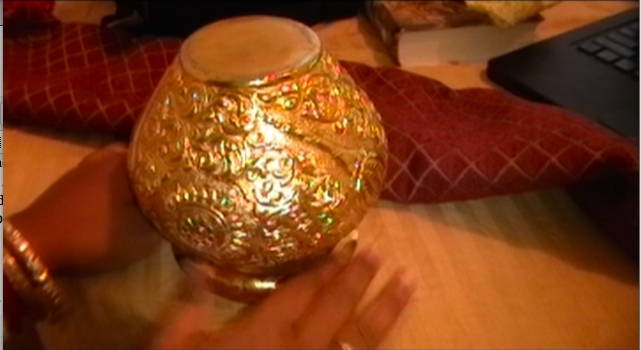 It was nice going to the temple in the evenings, getting my little ghee lamp and making my rounds to offer my little lamp to all the Deities amongst the hundreds of other devotees. And every night there is an amazing singer leading Damodarastakam and everyone dances and dances when he sings the mahamantra. Its like this for about a month and when its over, you feel like something is missing in the evenings. Dressing up and seeing all your friends. I used to sit near the stairs in Panchatattva’s hall, the stairs that lead up the extension hall, this is before they made that wooden cover thingy so that they have a place to put stuff for class, and then people started using it to keep their purses or backpacks. Anyway, I used to sit there, and just people watch. I like doing that sometimes. Actually, I did that every night. I really liked that area in Panchatattva’s temple room. Probably because its the least crowded and I could meditate on Panchatattva while I chant and watch people come in and out. Lots of different kinds of people, from every part of India and many parts of the world. New devotees, old devotees, walk through those doors in Panchatattva’s temple room. 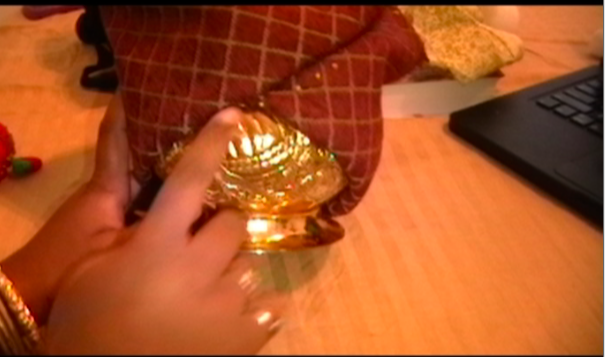 Fabulous devotees, simple devotees, everyone comes to offer their little ghee lamp hearts to Damodara. I dont know how I’ll adapt to Damodara Masa here in the states. Regardless, this is one of my favorite times of the year. Maybe I should observe some kind of vrata. I should give up sweets. Or maybe not. I want to take this opportunity to glorify my Guru Maharaj, who is an ocean of mercy. I know this because he took mercy on me. 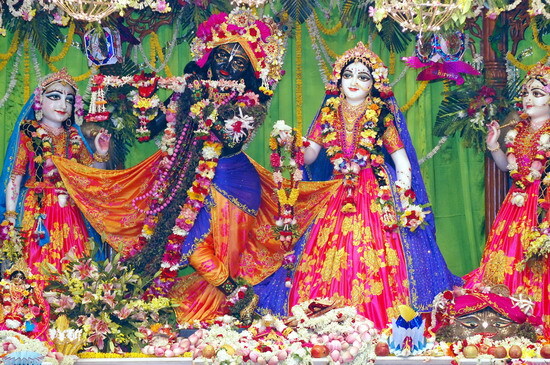 I saw so many times, when I had been shut out by so many devotees, he still saw some good in me and took a chance on me. He still had confidence in me in times when I lost all confidence in myself. He was the only person willing to pick me up when my whole life came crashing down. How do I repay someone as kind as him? He is the perfect example of Vaisnava etiquette. He is so intelligent. So caring and loving. I thank Krishna for bringing him to me. I thank Guru Maharaj for looking past all the dust and dirt and grime and seeing me for what I am. For seeing my potential. For giving me the bravery to be more me than I’ve ever been. How do I thank someone like that? Once, when I was sitting in class, Guru Maharaj was speaking and suddenly someone came in. I saw Guru Maharaj’s reaction, he looked up, and seeing who it was, he beamed a bright smile, welcomed the devotee and then continued with giving class. But in that moment, I thought, if Guru Maharaj could beam like that when I walked into a room, just once, and think to himself “there is Prema-Rupa, she is a good girl.” my life would be complete. I have literally sacrificed my entire life, my entire future, just to gain even a moments favor from Guru Maharaj. Because he took a chance on me. He believed in me. And I dont want to disappoint him. Once in class he said, “if anything needs to be done then you should be the one to do it yourself.” I have taken that instruction to heart and that is why I am here, in service to my Guru Maharaj. And hoping just one time he will smile at me, remember my name, and say that I am a good girl. I havent written in this blog in over a year. Its a shame really because I really like writing and storytelling. My problem is simply that Im lazy and I guess I assume that if anyone wanted to know what was going on with me, they would just add me on Facebook. But in this year I was so surprised at the amount of devotees that approached me and wanted to know what happened to my blog, maybe they’re waiting on tutorials or for me to tell more stories. People I would never expect! So maybe I’ll give it a go again. In this year I would say that I’ve been pretty busy. I spent five months in Sri Mayapur Dham studying in their Pujari Training Course at Mayapur Academy. And since coming back at the end of March I moved to Miami, Florida and jumped right into being a full-time pujari taking care of the large-and-in-charge Lord Jagannath, Baladev and Lady Subhadra. So I have a whole bunch of pics from Mayapur. I cant stop thinking about Mayapur. Its all I ever talk about and think about. You know what’s horrible? When I was in Mayapur, I couldn’t wait to come back to the US. Now Im here and I remember all the wonderful memories I had there and I’m dying to go back. The things that used to annoy me so much makes me laugh now. Darshans I used to shrug my shoulders at I now reverently observe though my computer screen. The peace and quite I begged for in the crowds of people, now replaced by an empty loneliness. I remember walking around and laughing with my friends. I miss being able to eat anything anywhere and never wonder about meat, eggs, fish, onion, garlic. I would chant in Panchatattva’s temple room in the evenings- pacing back and forth, begging to be Their instrument. I used to get knocked over by egar Bengali women trying to take Darshan of Radha-Madhava. I seriously miss mahaprasadam french fries. Something that good should be illegal. I used to ride my bicycle on the Main Road and nearly kill myself, but I would just jump back on again and speed toward Deity greeting. I miss rikshaw rides. I miss the boat between Mayapur and Navadwip Ghat. I miss Navawip, even though its a little ghetto and scary. I miss the house my husband and I are building together. I miss the headache. The heartache. And, yes, even the occasional stomach-ache. I miss sleeping in through mangal-arati with my husband and we both wake up in time to listen to the morning announcements on the radio. I miss the familiar faces. I miss that Krishna is part of a regular routine. I left since the end of March. But I still, really really miss Mayapur. By the end of the trip, I was tired of all the traveling we had done. I was hopeful that Mayapur would be a sweet relief, everything that it has been hyped up to be. From the first day I was pessimistic. Probably because the trip to Mayapur had gotten off to a bad start. Our train in Varanasi was seven hours late due to a terrorist attack or something. The train station in Varanasi was absolutely filthy- filled with giant rats the size of cats- I wish I were exaggerating. I had a fever of 104 degrees at the time and I was so sick and tired that I just lay a gamcha on the floor and tried to sleep. By the time our train arrived we were cutting it close to being able to celebrate Radhastami in Mayapur. When we boarded the train it had German roaches- what German roaches are doing in India Im not sure but by then I was so tired and irritated all I could think of was reaching the magical paradise that was Sri Mayapur Dham and hopefully in time for Radhastami. We made it just in time for the last five minutes of mangal-arati. It was completely packed with people and I felt overwhelmed with all of them pushing and shoving- I felt invisible. I had been separated from my husband during the program to our respective sides and I hadn’t seen him since- there were so many people. After mangal-arati I left the temple and sat on a bench, waiting to hopefully see my husband leave the temple. I chanted quietly and looked around. Through association with my husband I had learned a lot about Mayapur. I prayed and dreamt about being here, and now my dream had been fulfilled. Behind me was the beautiful lotus fountain and in front of me was the infamous Long Building. Everything was so big. I didn’t know anyone here. Suddenly, I felt like the smallest person in the world. My husband has daydreamt about living here but I wasn’t sure that I could. Its just too big. There are too many people here, there’s probably no service for me to do. I remembered all the villagers, pushing and shoving for the last bit of mangal-arati darshan of Radha-Madhava. Its too much. “Oh!…I couldn’t remember how to get back to our room. This place is so…big…” I said sheepishly. “I couldn’t find you.” I muttered, sad and embarrassed. Somehow Mayapur wasn’t what I expected. The Deity Darshan in the morning was nice, but again it was packed and people were still coming in. I tried to take Darshan, tried to absorb the mood of devotion and ignore the pushing and chattering of the visitors around me but its practically impossible. I had never experienced such a packed room in my life, and everyone was just pushing and shoving, one lady hit me in the back of the head and I was so crabby I probably could have knocked her out. When I was able to attain some peace at one side of the room, a female security guard approached me, “go there!” she instructed. I shrugged and complied, figuring that I was somehow in the way of the festivities and made my way a few feet ahead and to the left. After a few minutes I was approached by a male security guard, “move there!” he said, pointing to the spot I was originally standing in. Why can’t I just stand somewhere and take darshan on Radhastami in peace? I moved back to my original spot. This was not going well for me. I thought I would fall in love with Mayapur but so far all I’ve seen is a big place, with big buildings, and big Deities, and big noisy crowds. “I told you to stand there!” I turned and saw the female security guard, angry that I had returned to my original spot. 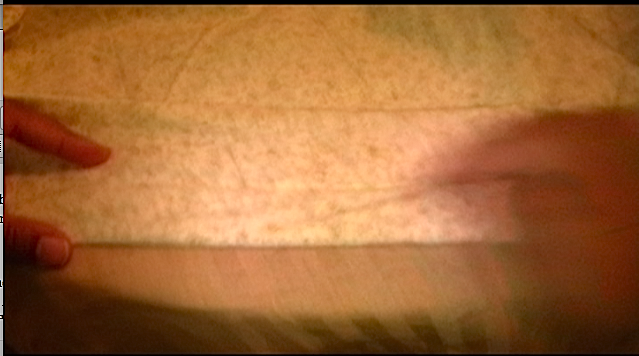 Unable to catch a break, I squished myself through the crowd and I left the temple room frustrated. The security guards were driving me crazy. No cell-phones, no cameras, they kept giving my father a hard time for wearing short pants in the temple. I know they’re just doing their job, I saw the lack of temple etiquette guests have, but cant they tell the difference between a regular polite person and a person who is unaware of temple behavior? It was miserable. While I was being miserable, my husband was having a blast. He was visiting with old friends and family, chit-chatting with bramhachari’s, and working on securing our property in Gaur-Nagar. He would often promise to be back in a moment but wouldn’t return for hours and I would be left alone in our room. It bothered me at first but its not like I wanted to go anywhere so why should I stop him from his good time? I was so startled by the amount and behavior of the visitors here that I wouldn’t go anywhere, no matter how much my husband tried to encourage me, I wouldn’t even attend any of the daily temple programs. I was perfectly content hanging around our room in the Gada Building all day being discontented and miserable. “Ghum? Sleep? No ghum. Japa.” I replied, pointing to my beadbag. She walked away and I resumed my japa. After a few minutes I got a tap on my shoulder again, I once again opened my eyes to see the same security guard, “No ghum!” she instructed sternly. I pulled together the best Bengali that I could, “Amar ghum na! Ami jap korchi!” Do I have to be one of those newbie devotees having a japa seizure for people to think Im having a focused, meditative japa? Frustrated again, I left the temple. As I walked back to my room I could hear the Nagar Sankirtan team in the distance. It was made-up of mostly international devotees and when I heard them singing, the tunes and styles, hearing the accordion and watching devotees of all colors and backgrounds dance and glorify Krishna together, it reminded me of America. It made me homesick. I had been in India almost two months, and this was the first time I wanted to go back. Beads for Sri Mayapur Dham Deities needed! I made my first visit to Sri Mayapur Dham in 2009 during Radhastami. Mayapur is the headquarters for our ISKCON Society and is home to the most beautiful Deities in the world- Sri-Sri Radha-Madhava and the Astasakhi’s, Sri Panchatattva, and Sri Narasimhadeva. Among my many adventures and life changing experiences in the Dham, a resident devotee gave me the wonderful opportunity of giving me a tour of the pujari rooms before I left Mayapur to continue my pilgrimage in India. While I ooh’ed and ahh’ed over the up close and personal view of the Deities outfits and the Deity jewelry- totally amazed by the love and patience it takes to make and organize all of Krishna’s things, the devotee told me that its hard to find good beads for jewelry-making in India and because beads are so heavy, many people wont bring much from their country. I asked her what happens with the old jewelry and she replied that its either sold as mahaprasad or just broken down and reused in another set of jewelry. Over the years, the Deities in Mayapur has become very close to me, I felt sad that they struggled to have nice beads for making jewelry. Feeling a little bold, I asked if there was any service I could do from abroad. She immediately replied, “please, bring back some beads, anything that you can bring would be so helpful. Whenever devotees bring jewelry to Jananivas Prabhu, our head pujari, he is so appreciative and moved when devotees offer this personal service.” I agreed that I would do my best and with that I left the Dham to catch my train to the next holy place in India. Since then, I have been meditating on how to best execute that service. Here is where your assistance is needed. I want to bring lots of beads to Mayapur Dham, my dream is to bring several luggage’s packed full of beads- I’ll take care of the extra baggage costs. I need devotees to make donations so that we can achieve this goal. 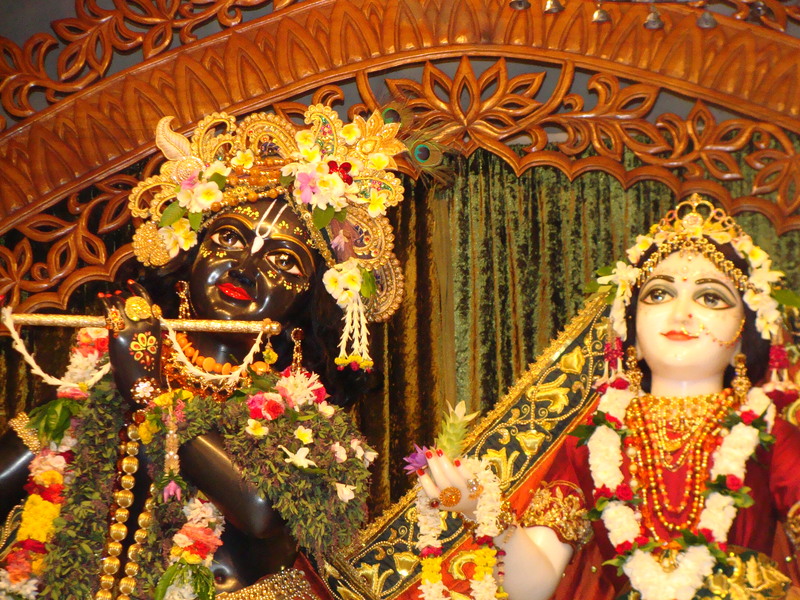 I know many of you have Mayapur Dham and Sri-Sri Radha-Madhava close to your hearts. For example, if you donate just $30 you can buy about 1,000 beads- which brings us closer to the thousands of beads needed for Their Lordships- but any amount, no matter how much or how little will be accepted. Can you imagine how wonderful it would be to present Jananivas Prabhu with so much jewelry-making beads and then show him the long list of donors that made it all possible?! The deadline for this rare service opportunity ends October 1st so please take advantage of this opportunity. I am ONLY bringing beads and items for the Deities in Mayapur, meaning that I will not carry items for godsiblings, family, BFF’s etc. all the beads they need are listed there, you can pick out what you want to donate to and it gets sent to me to take to Mayapur. If you are interested or have any questions please email me and I will do my best to serve you. I look forward to hearing from you and thank you very much for your time. I never knew Aindra. I dont have personal stories and the only time I saw him in person was when I was in Vrindavan last year for Janamastmi and I was so far away, I could barely see him. So why does hearing about his disappearance hurt so badly? I remember the first time I heard his kirtans. I only listened to the first minute, decided it was too slow, and didnt bother to listen to the rest. The second time I heard his kirtan I was on a road trip with my husband, at first I thought he was messing up my favorite tune and I was annoyed. But since in those days we only had CD’s we listened to it over and over and the more I listened to it, well, the more it stuck to me and I decided that I liked him. My husband likes slow, bhajan type kirtan while I pretend that Im a kirtan rock-star. I knew he liked Aindra because of his slow moving kirtan so I found a recording on the net and we listened to it when my husband got home from work. 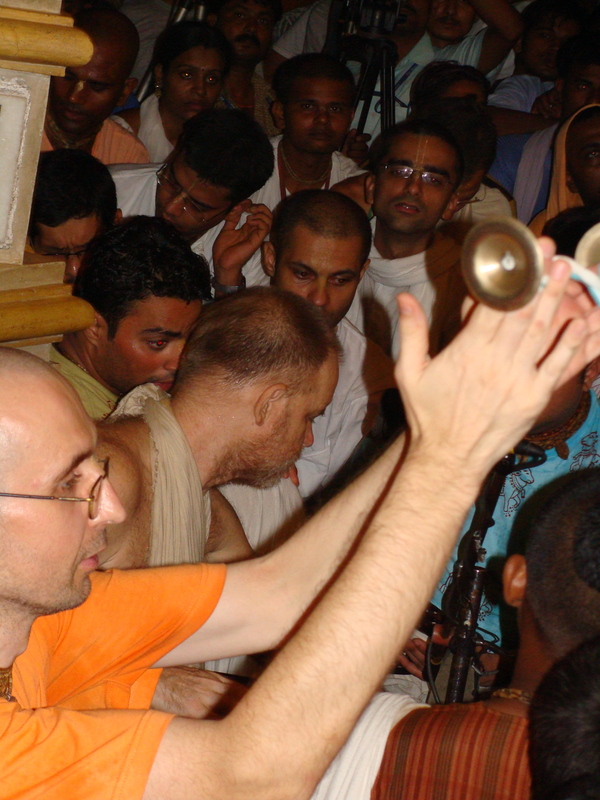 He started to cry, saying that the kirtan reminded him of Mayapur and he felt so much separation at that time. It didnt affect me as much. Until the kirtan started to pick up, mridangas and kartals playing faster, his voice crying our for Krishna- hey! He’s a kirtan rock-star too! And then I got the taste for his music. I downloaded more, a friend of mine gave me Vraja-Vilas and I was hooked. I relished the slowness. His voice was crying for Krishna, yearning from the soul, it awakens these wild feelings in your heart for something deep and meaningful in your life. To abandon everything and just do kirtan. Who could do this to me except Aindra? His kirtan tunes made me cry, they made me laugh, they made me dance. A devotee that used to travel with Aindra Prabhu back in the day told me that when he was in the US- his kirtans were ok. Nothing special. But something changed in him when he went to Vrindavan. Suddenly, like day and night, they became so beautiful and melodious. His Grace Aindra Prabhu passed away on Friday night but it has taken me until Monday morning to write about him without crying. His kirtans changed my life forever. It changed my kirtan style, it changed my heart! I couldnt understand why Krishna took him away in such a violent manner. He wasnt sick. He deserved to pass away peacefully in the company of devotees when he became super old. Not alone in his flat. I didnt want to accept it. A few people have died in my life, some of them close to me, some not so close. But it didnt affect me like his passing did. My friend, Vani-Seva talked with me about his passing and it was so helpful and it made me realize so many things. I wondered, why did so many of our devotees pass away so suddenly? We went down the list- Tamal Krishna Maharaj- car accident, Svarup Damodar Maharaj- heart attack, Gour Govinda Swami- heart attack, Suhotra Swami- heart attack, even Bhakti Tirtha Swami and Sridhar Swami- even though they were sick, it was very unexpected and they passed away shortly, the list went on and on. I realized it is because death can come at any moment- and us devotees need to realize how precious our time is and we should take up Krishna Consciousness so seriously. Dont you see? We say, “yeah yeah Krishna is the Supreme Personality of Godhead, I got it.” But do you really get it?! We only have so much time, we have to dedicate ourselves 100%, dont waste time! I was sad, I know he is with Krishna- I would never even doubt it. But we’ll never get his association again. I wanted to see him for Gaura Purnima during the festival in 2011. I wanted to fulfill my dream of dancing like a psycho during his kirtan. What will happen now? Where do those dreams go? But I know wanting to keep him here is an expansion of my own selfishness. How can I ask him to stay in this miserable material existence when he could be having mad crazy kirtan in Goloka Navadwip or running and playing with Krishna in Goloka Vrindavan? I was being selfish, he did his service, did the time, and now he had to go. My friend also helped me realize that when Krishna feels like you cannot progress any further in your spiritual life, he just takes you away so that you dont have to deal with pointless accumulation of karma. Aindra Prabhu was already there. He was already 100%. So Krishna just took him, he didnt need to go further because he was already there so what is the use of remaining in the material world if you are already 100%? I realized there are no small services, only small devotees. His service was simple. 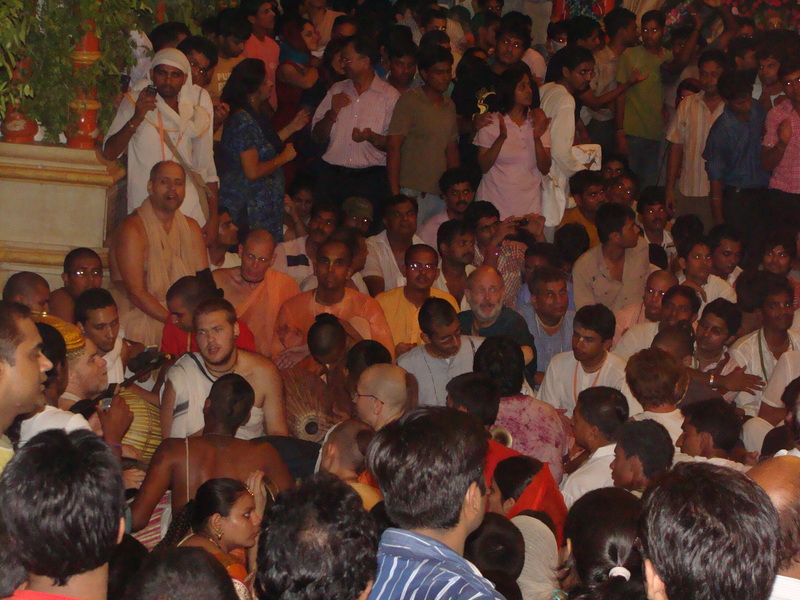 Kirtan before Gaura-arati and Deity dressing. He wasnt a great cook or a pakka pujari, he never became temple president and never served on the GBC. When I read about people who encounter him, they always say, “he and I were standing in the back when…” it amazes me how someone so simple can have such a profound effect on the whole world! It just proved that if we have firm conviction in Srila Prabhupada’s movement and dedication to our service, we can go so far and inspire so many people. There is a tune that I try to sing sometimes. It sounds like crying. Somehow it doesnt sound the same like when Aindra Prabhu sings it. You have taught me Aindra Prabhu. To dedicate my heart in kirtan. And to dedicate my life to Krishna. I want to give my everything. I want to be 100% too. Please pray for me Prabhu. I am fallen and foolish with no good qualities but by your mercy I can do something for the pleasure of Krishna and devotees. Thank you Aindra Prabhu. Thank you. All glories to the life and passing of His Grace Sriman Namacharya Aindra Das Prabhu! I have received a number of requests about how I make Deity turbans so Im finally making a tutorial about it. Im not a professional, I never got any real training, but I do watch what others do and have received a few tips from my husband, who used to be a pujari in Chicago. So opinions and experiences may vary. I think turban bases are important because it not only provides structure and stability to your turban but you have a lesser chance of pricking the Lord’s head with your pins and mukuts. Also, it gives you the ability to make your turban away from the altar, you can make the turban ahead of time or even entrust the responsibility with someone else while you do the Deity dressing. I definitely recommend making a turban base. The fabric I like to use for the base is the home décor type because its thicker and stronger than other types of fabric. 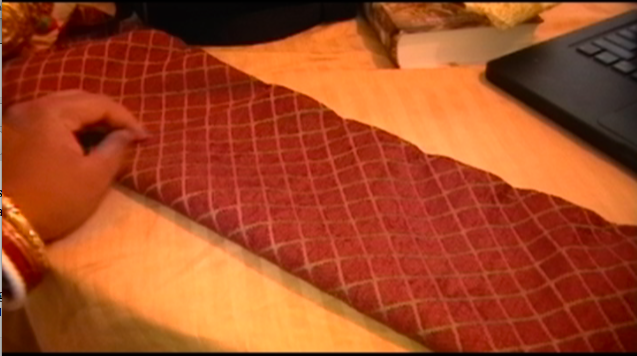 Just fold the fabric a few times and sew it horizontally to hold the fabric in place. Before you go ripping up your couches or tearing your curtains, you can also use cotton fabric and line it with unrolled cotton balls. 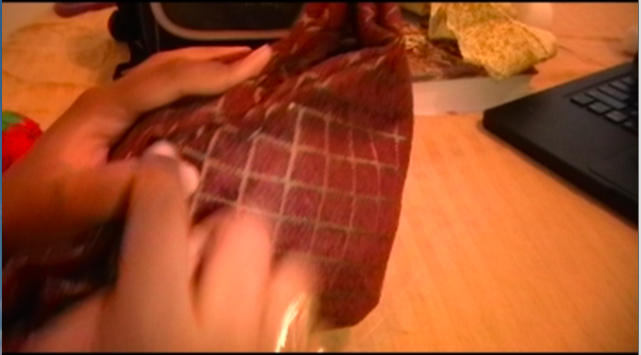 After lining it, fold the fabric over and sew horizontal lines to hold the cotton and fabric in place. Feel free to make more layers until your desired thickness. Oh, and don’t forget to measure your Deity’s head. We’re going to pretend this kalash is the size of your Deity’s head. Actually, when I used to make turbans for the Deities at our ISKCON center in Orlando, Their heads were the exact same size as a kalash, so while one pujari was dressing the Deities, I would be in the pujari room, each base on a kalash, wrapping turbans. You’ll probably have to start sewing by hand at this point. Sew the front of the base. Now you fold the top like you wrap a gift. 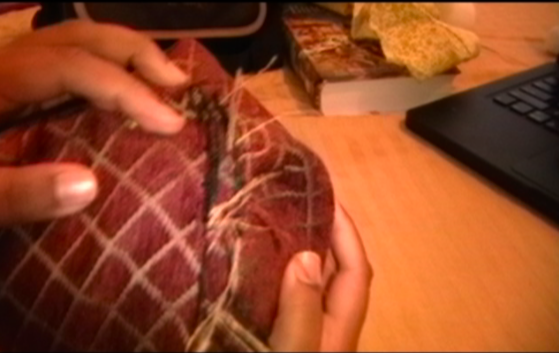 First stitch from the front of the turban to the back. Fold the front and the back pieces of fabric, the front over the back. And stitch along the edges. Feel free to go over your stitches or stitch all over the place as many times as you want, you want it to stay strong! Don’t feel bad if your base is kinda ugly, its just a base and it gets covered over anyway. Making a cloth base is great for big Deities and Jagannath, Baladev, Subhadra Deities (you wouldn’t make it for Subhadra of course). 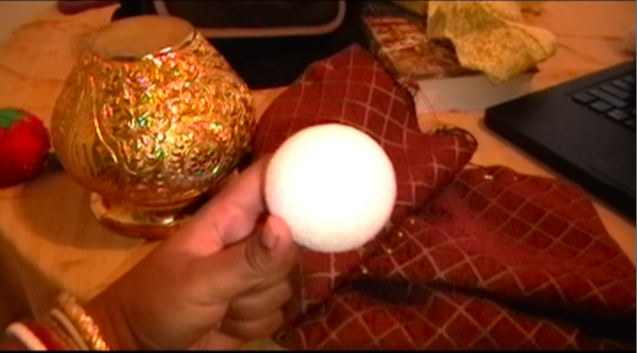 If you have smaller Deities like I do, another base you can try is with a Styrofoam ball. I like to use Styrofoam because it hold the pins really well. The only downside is that you have to replace it every so often as it tends to get broken-up with use. 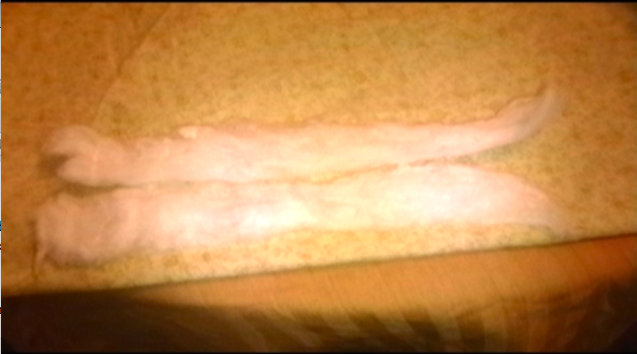 Just cut off the bottom, scrape out the insides to fit the head, and the outsides into the shape of a base. I hope this tutorial was helpful! If you have any questions, leave me a comment, find me on facebook, email me, etc. In my next tutorial, I’ll show you how to wrap a basic turban.